February 6, 2013 By This post may contain affiliate links. 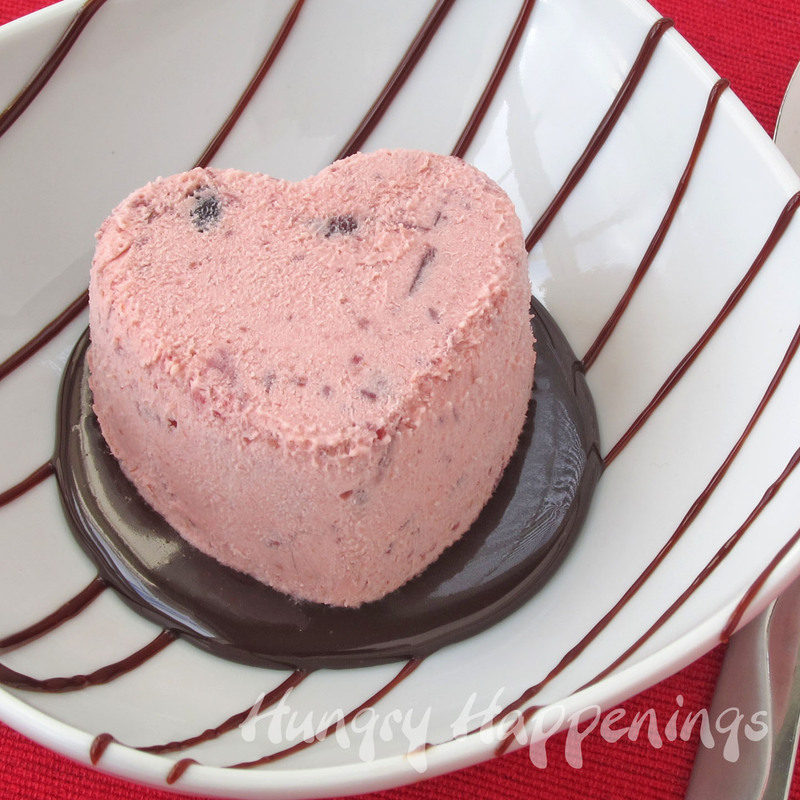 Cool off all the hot love this Valentine’s Day with these Cranberry Orange Semifreddo Hearts. Enjoy some delicious Italian ice cream with some elegant flavors to accompany it. Have you ever eaten or made a semifreddo, an Italian semi-frozen dessert? My friends never had until yesterday. They had all gathered in my kitchen to eat, talk, make chocolate, and say good-bye to a dear friend who will be moving soon. They had spent hours filling their bellies with appetizers and were totally occupied with making and snacking on marshmallow cream filled hearts, chocolate dipped potato chips, and chocolate covered macadamia nuts, but silly me decided to serve them dessert.I knew they wouldn’t eat much so I just put out two of the Cranberry Orange Semifreddo Hearts. I explained that the frozen treats were like a cross between a custard style ice cream and a whipped fruit flavored mousse and that they should allow them to sit for a few minutes to soften. I left spoons for everyone and they went back to their candy making. A few minutes later I heard, “oooh, creamy,” “it’s fruity,” and “so refreshing.” They all took a few bites, then went back to work. I’m not too sad that more of them didn’t get eaten because we can now enjoy them for dessert on Valentine’s Day. They will keep well in the freezer for several weeks. Place the dried cranberries, cran-apple juice, orange juice and orange zest in a medium saucepan and set the pan over medium-high heat. Bring to a boil then reduce the heat to medium-low and cover. Simmer the cranberries for 12-15 minutes, until the liquid is almost gone and the cranberries are plump. Remove the pan from the heat. Reserve 2/3 cup plump whole cranberries. Puree the remaining cranberries in a food processor or blender until smooth. If using a stick blender, you can puree cranberries right in your pan. Leave in food processor while making the custard. Pour the half-and-half into your saucepan and set over medium heat. Allow it to just begin to boil. Meanwhile, in a bowl, whisk together the egg yolks, sugar, and salt until light and fluffy. While whisking, slowly pour in about a 1/3 of the hot half-and-half. Then, pour the egg mixture into the pan along with the half and half. Cook over medium-low heat, stirring constantly, until the custard is thick enough to lightly coat the back of your spoon or spatula, about 5 minutes. Remove the custard from the heat and stir in the vanilla. Pour custard over your cranberry puree in the food processor or blender and pulse until smooth. Pour into a large bowl and fold in the remaining whole cranberries. Chill in an ice bath or refrigerator. In a large bowl, whip the heavy cream to stiff peaks. Gently fold the whipped cream into the chilled cranberry custard. Spoon mousse into the heart shaped molds. Freeze for at least 4 hours. Remove from freezer, and un-mold the hearts. You may need to dip the bottom of the heart mold into warm water for about 20 seconds in order to get the hearts out nicely. Keep frozen until ready to serve. I drizzled some chocolate sauce on some bowls and plates and set the frozen heart on top. 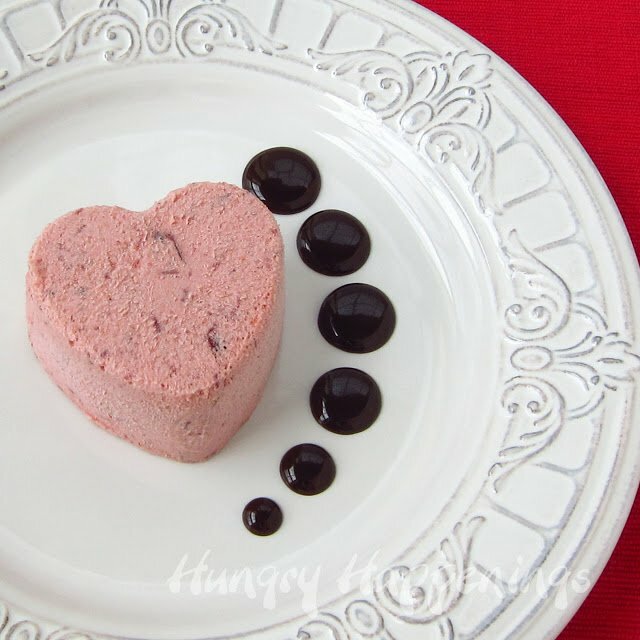 Allow the Cranberry Semifreddo Hearts to sit at room temperature for a few minutes to soften slightly before eating. Half and Half is a mixture of one part milk to one part cream. It's a very common dairy product here in the states, and I didn't realize it wasn't available in other parts of the world, so sorry I didn't explain. If you can't get it, just mix milk with cream and you'll be fine. I actually do that all the time as I always have milk and heavy whipping cream on hand, but don't often have half and half. Thanks, it's so nice to hear compliments on my photos. I work very hard on my photography, but do struggle a lot with it. I'm glad you like these photos and the dessert. Oh my goodness Beth do these ever look delicious and refreshing. Just what the doctor ordered, my mouth is watering! these sound delish and are pretty too! I hope you enjoy these semifreddo hearts. I love this flavor combination and these are a great frozen dessert. 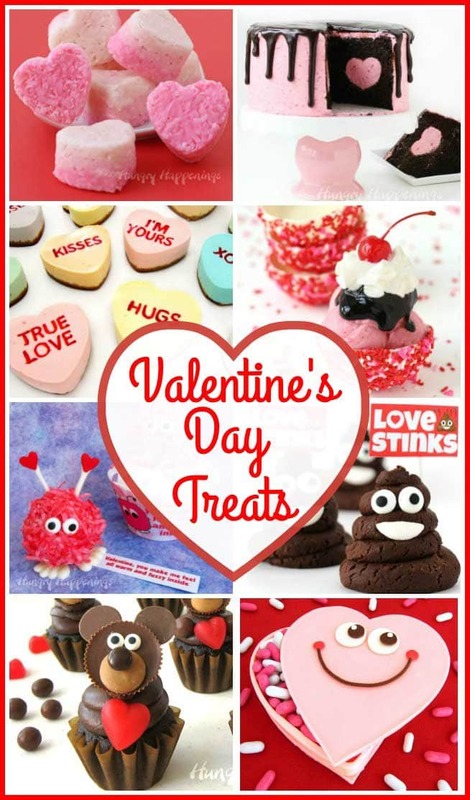 The molds are easy to use and your hearts should look just like my pictures! Have fun and thanks so much for your kind words. I made these tonight and it was a little too sweet for my taste, but still very good. Is there anything you could recommend that I could do to cut back on the sweetness? You can balance out the sweetness by using lemon juice instead of orange juice in the recipe. It would add some tartness and cut the sweet.